Rotary switches are available in all different models already existing for the potentiometers: 6, 9 and 14mm in carbon and cermet technology. Please, refer to those sections to choose the external configuration of your switch. 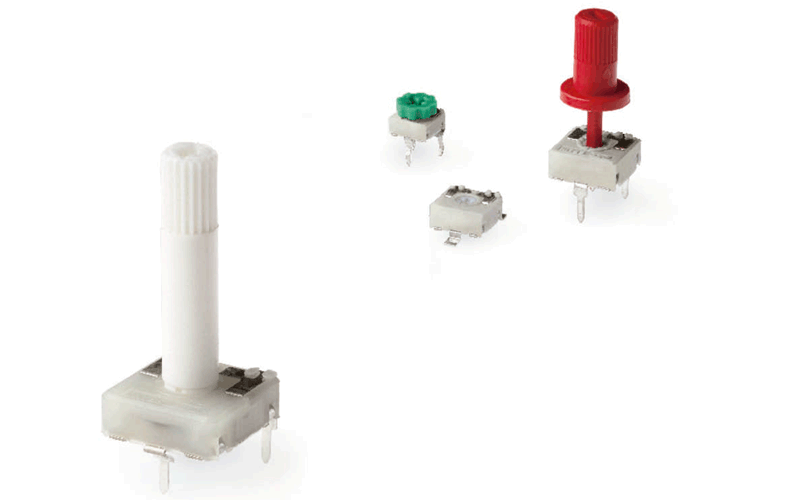 ACP’s Rotary switches are based on the design of the potentiometers: they have one input and two possible outputs. The commuting angle between outputs can be customized. Through-hole and SMD configurations are available. Terminals and collector are normally manufactured in tinned brass, although versions with steel terminals are also available under request. Terminals for through-hole models can be provided straight or crimped, which helps hold the component to the PCB during soldering. The switch has Ingress Protection rating type IP 54 (high level of protection against dust and also against water splashing), according to IEC 60529. Plastic materials can be self-extinguishable according to UL 94 V-0 under request. Thumbwheels and shafts can be provided either separately or already inserted in the switch. - Positioning of the wiper (the standard is at 50%). - Housing and rotor color. - Pause effect (recommended for each possible circuit position). - Self-extinguishable plastic parts, according to UL 94 V-0.